The new cloud macchiatos come in caramel and cinnamon. (CNN) — Starbucks just unveiled its latest coffee drink: The cloud macchiato, made with egg-white powder. The new drink, which comes iced or hot, will be served at stores in the United States and Canada and is a permanent addition to the menu. Introducing a new type of foam fit for both hot and iced drinks is a way for Starbucks to drive growth in its successful line of cold beverages — and help build excitement around new cold beverages as customers move away from Frappuccinos. For the cloud macchiato, Starbucks drew inspiration from a Spanish drink called leche merengada, or “merengue milk.” An in-house team developed a recipe for the cloud powder that includes egg whites and milk for a meringue-like texture. The resulting foam is comparable to Starbucks’ cold foam, which it introduced broadly last year. The cloud macchiato comes in caramel and cinnamon flavors. The coffee company first teased the cloud macchiato during its investor day in December as an example of how the company is innovating its iced beverages. Cold drinks “have contributed to more than 80% of our beverage growth over the last two years,” Starbucks Chief Operations Officer Rosalind Brewer said at the event. 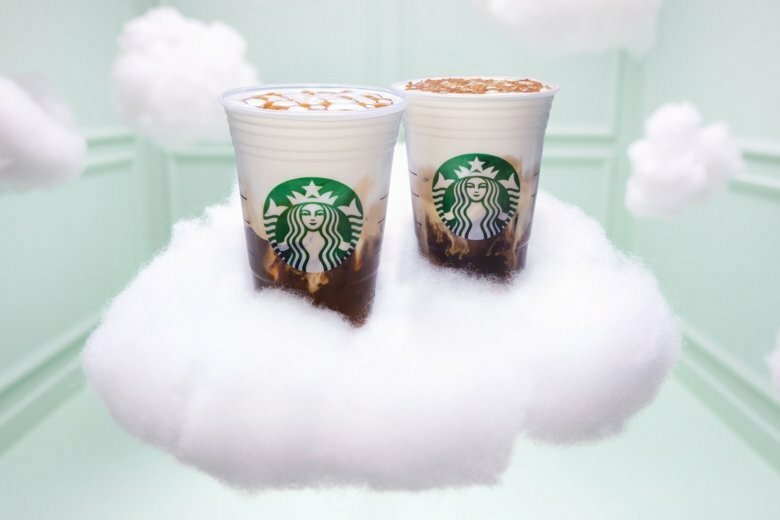 Starbucks’ new cloud macchiato also may have a celebrity tie-in. Rumors swirled that pop singer Ariana Grande may be involved in the product launch after Grande and Starbucks posted matching tweets. “We’ve long been fans of Ariana Grande’s and were excited to work with her to celebrate our shared love of clouds,” a Starbucks spokesperson said about the reports. For Starbucks, innovations in cold drinks — and buzz from celebrities with huge social media followings — may help lure customers who have lost interest in Frappuccinos. Instagrammable Frappuccinos used to help drive sales for Starbucks. But in recent years, customers have turned on the sugary blended beverages. For the first time last year, the company expanded a happy hour promotion to include drinks beyond Frappuccinos, and limited discounts to customers who register online or use the Starbucks app. The company is still selling indulgent Frappuccinos, but it’s also been quietly testing a lower-sugar option.